PSsst. Got some NNY Headshots for ya in my van. 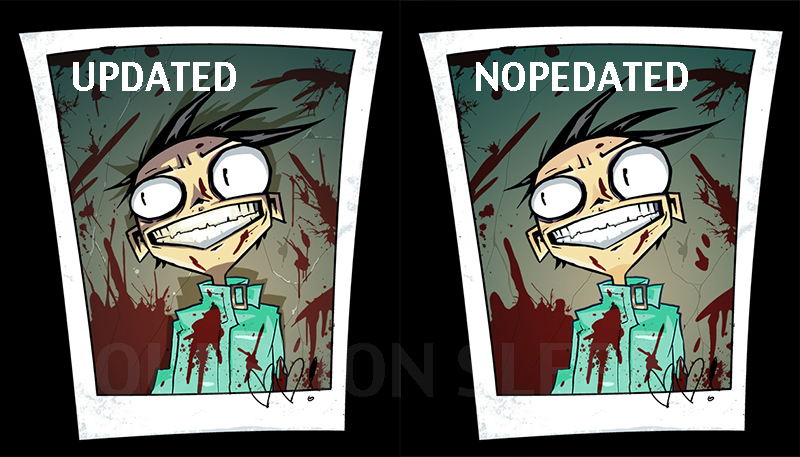 So I had some revised NNY head shots with me this recent San DIego Comicon. If ya recall, the original NNY Headshots were taken down from the $Z.99 store. The ones I took to San Diego were a little different from those older ones, a little more polished and detailed. You can see the changes are mostly in the shadows and the details on the cracks. Juts a bit more dimension, ya see? They won’t be up on the store permanently, however, only until these leftovers sell out. I hope they sell out soon because they’re kinda going bad and the smell, man…the SMELL. This entry was posted in comics, fine things, prints and tagged comicon, NNY Headshots on August 2, 2013 by Jhnen VEE. So Comicon is coming up, we’re trying to make room for stuff and we’re sick of eating off or furniture made from screen prints and using screen prints as toilets, so to make some room $Z.99 is having a screen print sale! 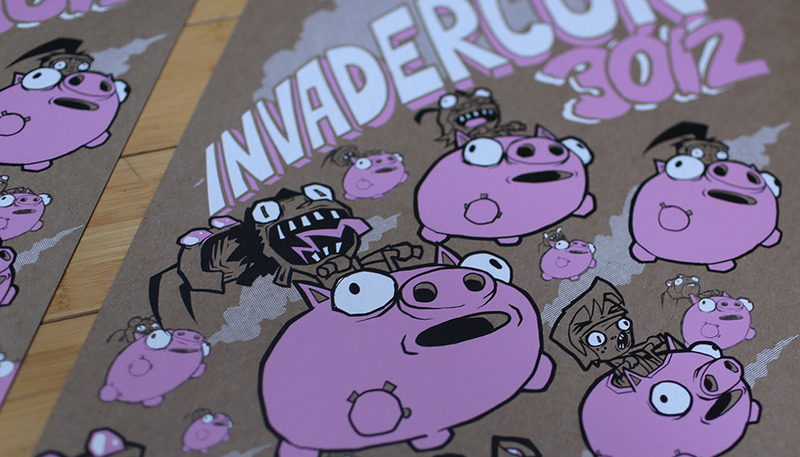 Save big on some seriously fine things like the INVADERCON 3012 print and the Creepachu print sets by Jhonen Vasquez and Jenny Goldberg. We don’t want to use these as toilets, but they’re pretty much sitting on TOP of the toilet, and it’d be great if we could just clear them away a bit. Thanks! This entry was posted in $Z.99, fine things, prints, works on July 5, 2013 by Jhnen VEE. 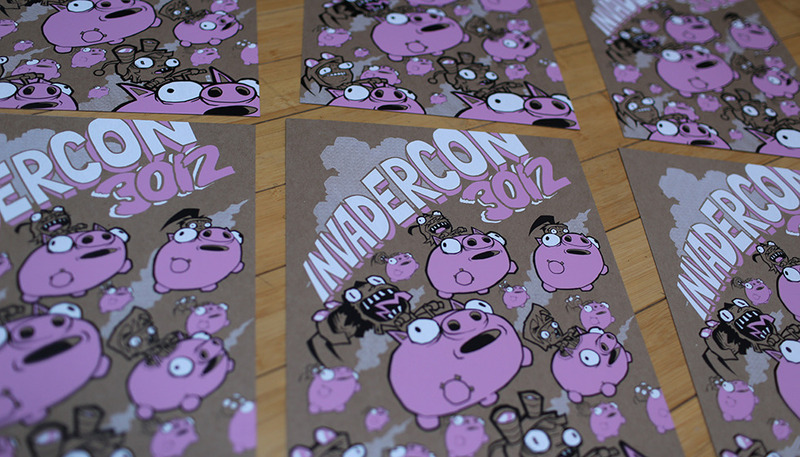 INVADERCON 3012 limited prints for you to hug or choke on! The original designs for these were for a ZIM convention that took place last year, but these have been slightly altered so that they’re from the future, just about a thousand years in the future to be exact. The future rules, ladies and gentleman. They’re a bit smaller than the original prints, there’s a bit more color, they’re from the future. Also, the chipboard stock they’re screen printed on is so horribly thick that they barely bend and is so heavy, if swung at just the right angle, could probably chop a person’s head off. 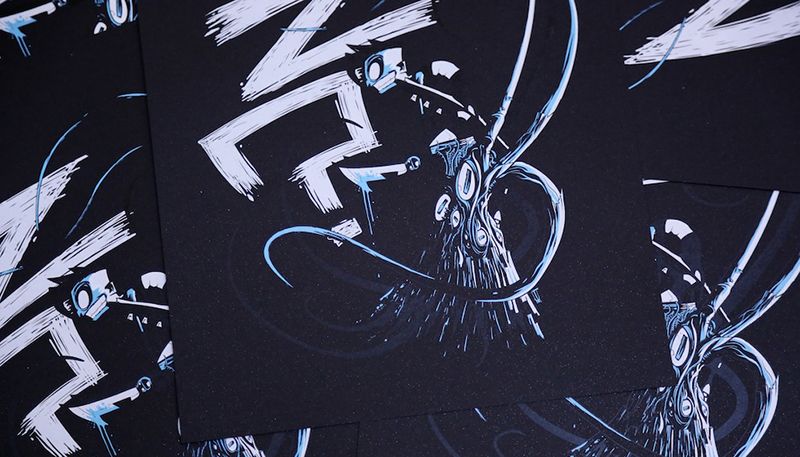 If you succeed in chopping a head off with one of these prints, please send photos. Prints are signed with a general sense of ambivalence. 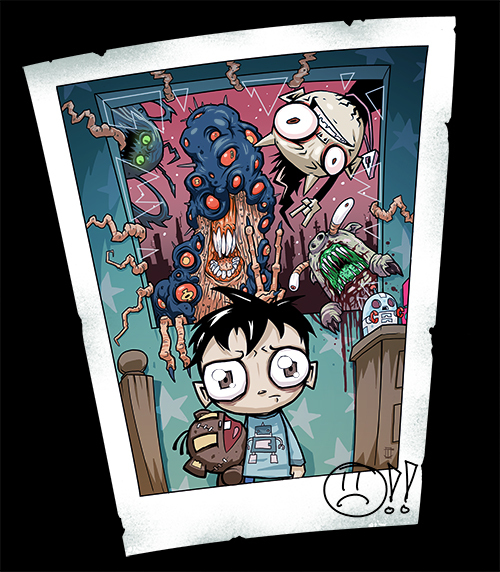 This entry was posted in $Z.99, fine things, prints and tagged Dib, GAZ, GIR, INVADER ZIM, screen prints on March 18, 2013 by Jhnen VEE. How could anyone have trouble sleeping with a bloody hellpig like that smashing through your window? Some kids are just so spoiled. 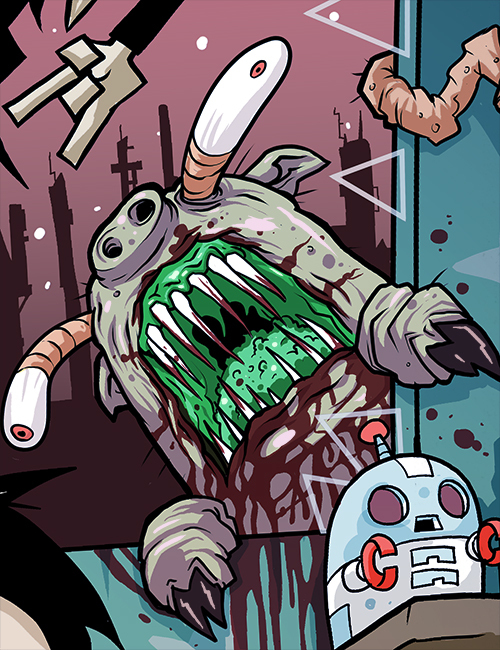 This entry was posted in $Z.99, comics, fine things, prints, works and tagged $Z.99, hellpig, prints, SQUEE! on February 11, 2013 by Jhnen VEE. This entry was posted in $Z.99, fine things, prints, works and tagged Creepachu, JTHM on January 7, 2013 by Jhnen VEE. 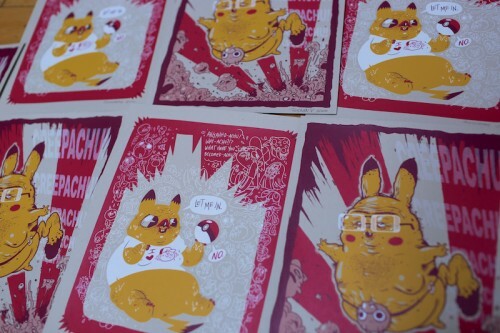 After a little delay, the Creepachu screen prints JR Goldberg and I did are just about ready to gelatinously explode into the $Z.99 store this coming week (currently down for maintenance getting all tarted up for you! ), so keep an eye out for them but don’t get any in your eye or you’re just outright fucked. 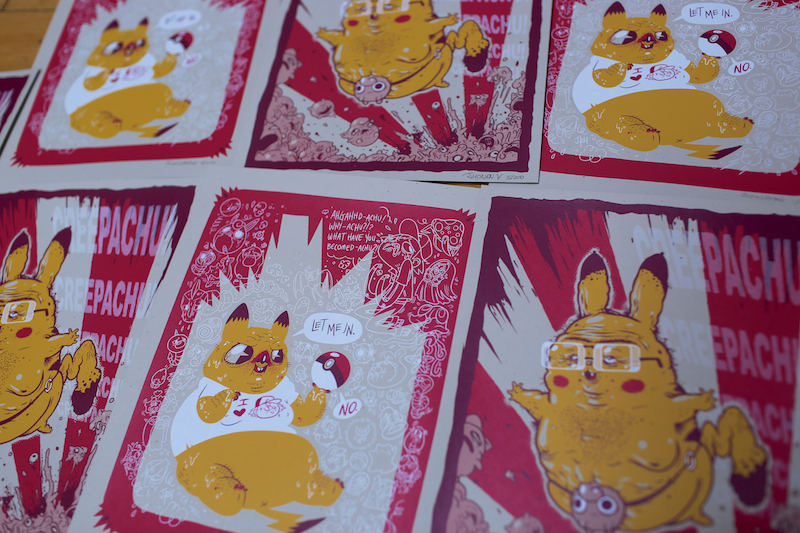 It’s a two print set, with Goldberg and I each taking a stab at the kind of Pikachu you don’t want getting anywhere near you or your loved ones. 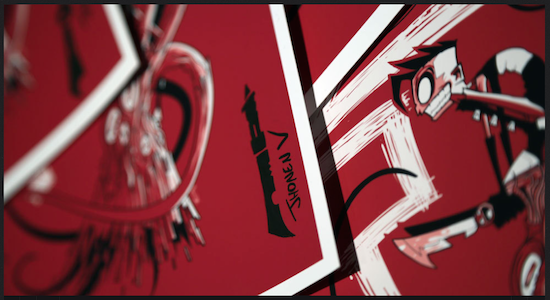 The set is $60 and each print is signed by their respective jerk! This entry was posted in $Z.99, fine things, prints, works and tagged Creepachu, J.R. Goldberg, signed screen prints on November 16, 2012 by Jhnen VEE.